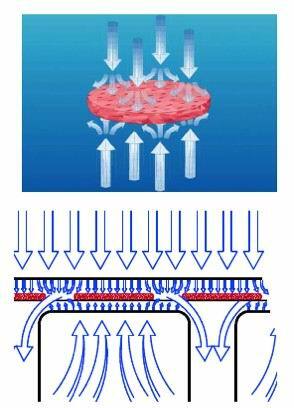 These facilities are based entirely on the technique of fluidization: a layer of solid food elements of small size is sustained by aerodynamic forces generated by a crossing stream of cold air, from bottom to top, so that the individual elements are suspended on a fluid bed. As each element is not at rest but dynamically describing random trajectories, with a tendency to follow the direction of gravity, by placing the feed hopper in elevated position respect to the outfall, we obtain a spontaneous progress of the product, as if it were in liquid phase. 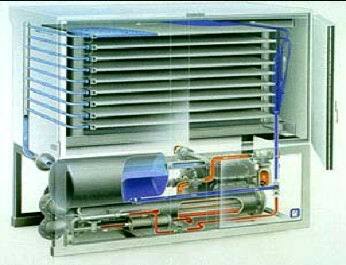 A uniform distribution of the vertical air stream is obtained by using a perforated plate placed at the upper closure of a plenum, where the evaporating coil are usually placed. 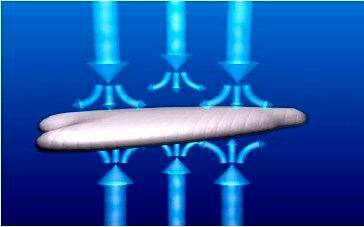 The optimal operating conditions are determined by controlling the ratio between the air velocity and the thickness of the fluid bed. Air speed control is required, ranging from a minimum value, necessary for the airlift, and a maximum value, beyond which the product is blown away. Froude number can be considered a good selection criterion: if the particle shape is similar to a sphere with a diameter D, a good value of Fr=(v / (Dg)) is about 120: the limits in order to obtain a good fluidization are from 65 to 160. 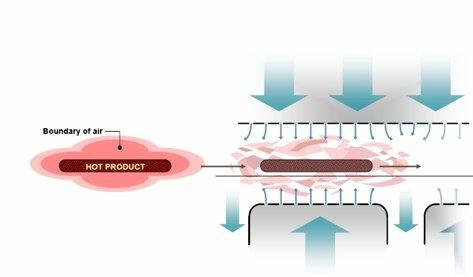 By increasing the thickness of the fluidized bed layer, the transversal pressure drop increases resulting in a higher energy consumption: maximum efficiency in terms of frozen mass per energy cost is obtained for food thicknesses from 12 to 15 mm. 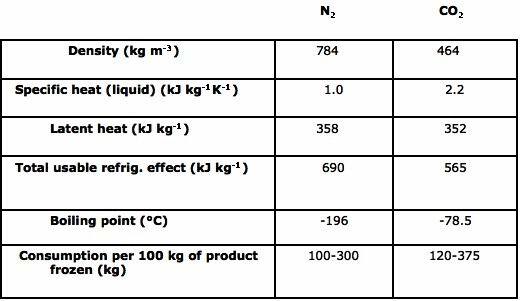 The system of fluidization can achieve high values for the heat transfer coefficient in air freezer due to high fluid velocities required for airlift and the small size of the particles (which means small boundary layer thickness and high thermal gradient). 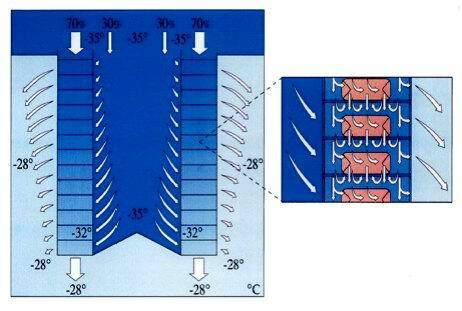 The air in the fluidized bed is under conditions of strong developed turbulence. Cryogenic coolant may be sprayed on food or food may be immersed in cryogen. Carbon dioxide: freezing capacity (85%) is available from the subliming solid but at higher temperature compared to the previous one. The product is exposed to a liquid refrigerant causing the lowering of temperature and freezing due to its phase transition. The efficiency of the process is governed by the possibility of recovering the refrigerant (rather expensive) at the end of the freezing process; for above mentioned reason, this type of treatment is often used ony for high-value products. The advantage lies in obtaining a higher quality product when the rate of formation of ice crystals is a quality parameter. The product should be kept in contact with the plates during the freezing. The refrigerant does not come into contact with fluid. Can operate in batch or continuous. They are quite efficient but the shape of the food is a limiting factor. The residence time depends on the conductivity of the product. The thickness of the product plays an important role. You get the same effects but with different costs of cryogenics (minors) and more flexibility.